Double freedom for professional users in trade and industry: With the battery pack system you can not only work without cable, but you can also use the machines of different manufacturers. Metabo, in conjunction with Rothenberger, Mafell, Eisenblätter, Collomix, Haaga, Starmix, Eibenstock and Steinel have signed up something which is unprecedented in the industry – a manufacturer-independent battery pack system. With its LiHD battery packs, Metabo delivers currently the most powerful technology on the market. The high-performance cells from Nürtingen have convinced the CAS partner companies as well. The basis of the Cordless Alliance System (CAS) is the Metabo’s battery pack technology. In the past years, the German manufacturer has conquered in this area of technology leadership with a whole series of innovations. The latest step towards its vision of a cordless construction site is the 2nd generation of Metabo 18V LiHD battery packs, the 8.0 ampere hours (Ah) capacity battery pack with only 10 cells delivers a massive 1,600 watts of power. “With LiHD we have enough power even for the most energy-intensive applications. Therefore, we can today build any hand-held power tool as a cordless machine – and in such a way that it meets the requirements of professional users in terms of power and endurance”, says Scott Thompson, Metabo`s UK National Accounts Manager. 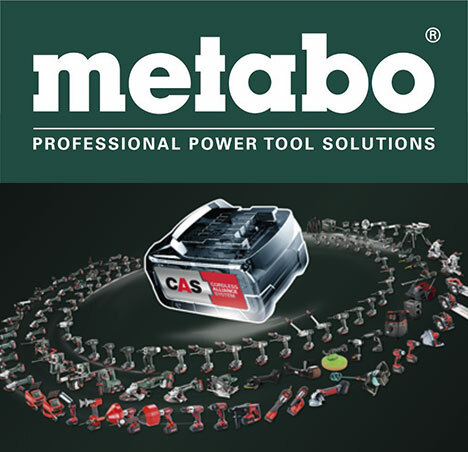 Metabo were thinking about the professional users when the idea for CAS was created. “We intensively discuss the requirements and wishes of our users. And in many of these discussions, one request was at the very top of the list: The flexibility to be able to work with only one battery pack system and the machines of different manufacturers. For mains-powered machines this is not a problem, since the socket is the universal interface of all manufacturers. However, the battery pack systems of the individual manufacturers have not been compatible with each other until now. Ultimately – One battery pack – for 9 different partners. With CAS, professionals can switch between different manufacturers without having to purchase a new battery pack or charger.